The foramen ovale is found in the fetal heart where it allows blood to go inside the left atrium from the right atrium. 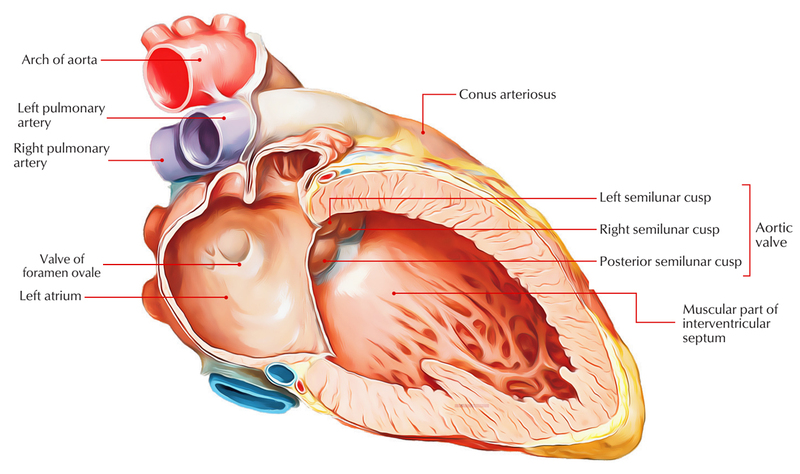 It is among the two fetal cardiac shunts, the ductus arteriosus is the other one which allows blood to bypass the pulmonary circulation that still discharges towards the right ventricle. The foramen ovale closes at birth in most people. It later creates the fossa ovalis. The foramen ovale is the opening in the middle of the upper as well as lower extremities of the septum secundum. Blood is thrust via the foramen ovale throughout embryonic life from the right atrium to the left atrium. Decline in right atrial pressure via obstruction of placental circulation. Rise in left atrial pressure as a result of increased pulmonary venous reoccurrence. In order to create a capable closure, the valve of the fossa ovalis is forced contrary to the limbus. The valve and limbus fuse anatomically in order to produce a permanent seal as well as a closed atrial septum throughout the first year of life. Fossa ovalis is a shallow oval depression located in the lower portion created via septum primum. It symbolizes the position of foramen ovale in the foetus. The eustachian valve directs the blood of IVC towards the left atrium via foramen ovale throughout embryonic life.